Trijicon TA02 TA02 ACOG 4x32 Red LED Illuminated .223 Crosshair Scope FREE SHIPPING! 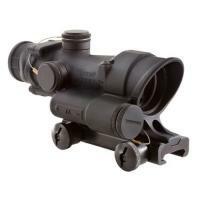 The Trijicon TA02 ACOG 4x32 is an LED-illuminated tactical riflescope. Its adjustable brightness controls allow you to select from six levels to adapt to changing lighting conditions, ensuring that your reticle shows up over the target without dazzling you. The classic crosshair reticle features bullet drop compensation markings for enhanced accuracy at longer ranges, calibrated for .223 rifles. Its brightness also allows use of the Bindon Aiming Concept, in which both eyes are kept open to preserve peripheral vision. The scope is made from durable aluminum for shock and wear resistance, and comes with a TA51 mount adapter that can be attached to a Picatinny rail. ©2002-2019 CopsPlus.com: Trijicon TA02 TA02 ACOG 4x32 Red LED Illuminated .223 Crosshair Scope FREE SHIPPING!